An essential component of the famed Hampton Diet! The exalted macadamia is not only a prized edible nut it is also makes a fine food oil, with a unique and delicate taste. Macadamia oil contains one of the highest levels of mono-unsaturated among all food oils, contributing to a nutritious and balanced diet. 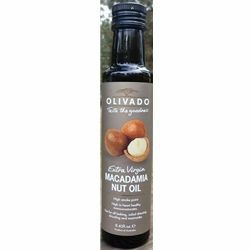 Olivado macadamia oil is made from quality nuts supplied from Australia's sunshine state, Queensland. With its mild, nutty flavor, and a very high 450 degree F. smoke point, this golden colored oil is ideal for bread dipping, as a salad dressing and great for frying, roasting and cooking a variety of meats, fish, chicken and vegetables. It can also be used in baking and is especially good in pastries. Our product is cold-pressed, extra virgin, all natural, with no additives or artificial ingredients.